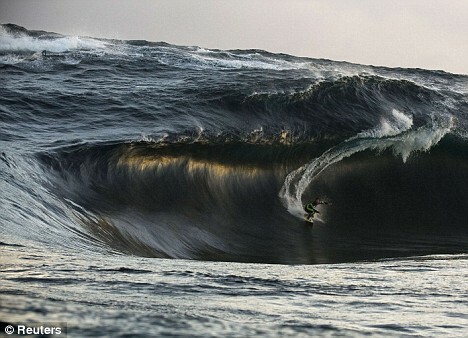 The moment surfer takes on 41-foot monster wave... and lives to tell the tale: "A daredevil surfer is pictured tackling a giant 41 foot wave in a bid to win himself a prestigious award. Kerby Brown took on the monster during a session at a top secret reef, and nearly didn't live to tell the tale. Moments after these pictures were taken, he suffered a devastating wipeout which nearly killed him."